The best baby photography props! There is much truth in the old saying about never working with children or animals. This often seems especially true with babies! They change so much from day to day, and you can see these wonderful new facial expressions and body gestures that you just have to capture on camera: yet when you try and do so, chances are they will go all still and quiet and your much-anticipated photo just doesn’t happen. It is so frustrating! No-one will believe the amazing things your baby can do because it’s only you that can see them. Baskets and bowls Ideal for newborn photography, a basket or bowl will make your baby feel safe and secure and increase your chances of having a peaceful photoshoot! Choose a basket or bowl in a lovely natural material such as willow or driftwood. You can then customise this by lining it with a blanket or shawl of your choice - or a flokati (see below) - which will also ensure that baby stays snug and warm throughout your photoshoot. Flokatis and faux furs A flokati is a handmade fluffy wool rug. Flokatis have been made in Greece for hundreds of years and, whilst the natural colour of a flokati rug is off-white, they are often dyed different colours. Flokatis and also faux fur rugs are an ideal backdrop for a baby photo. The colour will bring out the natural delicate beauty of your baby and keep him or her snug whilst you snap away! Painted furniture A colourful piece of furniture can really transform a baby photo. It may need a little creativity on your part to get it just right! Have a look round for a baby bed, children’s chair or rocking chair, or a little bench, then if necessary spray paint it to the colour you want. Your upcycled item can then make the perfect prop for your baby photo. Older babies in particular will enjoy having something interesting to sit on, so it could be your ideal opportunity to get that perfect shot! Cuddly toys Those of us old enough to remember The Generation Game will know that there was always a cuddly toy on the conveyor belt!. Similarly, it would seem negligent to have a series of baby photos without a cuddly toy in there somewhere! A cuddly toy is wonderful at calming your baby and giving them something to focus on as you take your photographs. If it is one of your baby’s favourite toys, you will also be preserving the memory of that toy - and your child playing with it - for years to come. Just ensure the toy does not dominate the photo or block the view of your baby, but hopefully it will be something that will make your little one laugh and smile! Headwear If you want to dress your baby in something special for the photo then choosing some gorgeous headwear could be the way to go. There are so many cute baby hats out there, from the traditional knitted bonnet to something more niche such as animal hats or something seasonal. As an alternative to an entire hat you may want to consider some kind of bandana or headband. Whatever you choose, it will also have the added advantage of keeping your baby warm during the photo session. Enjoy your baby and we hope that you can use the above tips to get your perfect photo. 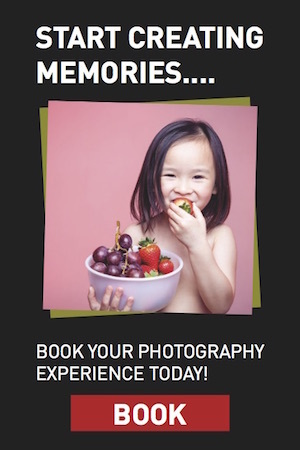 You may also want to consider having some professional baby photography done to preserve the memories of your child’s wonderful early days and weeks. If so then do get in touch with Venture Studios to discuss how we can help!